A twinning project “Upgrading the National Environmental Monitoring System (NEMS) of Azerbaijan on the base of EU practices” was presented in Baku on February 15. 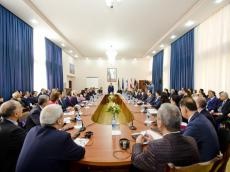 Ecology and Natural Resources Minister Huseyn Bagirov, Head of the Cooperation Section of the EU Delegation in Azerbaijan Yeroen Villems and Harri Pietarila, the Member State Project leader from Finland participated in the meeting, the ecology ministry reported. The project aims to strengthen environmental monitoring system ensuring provision of the high quality information that does support strategic environmental policy planning and compliance control. It will contribute to the improvement of Azerbaijan's environmental performance, especially regarding the air quality. The project's duration is 27 months. Twinning project will be carried out in four directions: the institutional framework, ecological monitoring systems, capacity building and training, pilot experiments. The consortium of the Finnish Meteorological Institute (FMI) in cooperation with Latvian Environment, Geology and Meteorology Centre (LEGMC), Umweltbundesamt GmbH (Environment Agency Austria, UBA) and Finnish Environment Institute (SYKE) will provide the implementation assistance. Azerbaijan takes significant steps to solve the problems regarding environmental protection and rational utilization of natural resources. There were realized large-scale state programs for the sanitation of the ecological situation in the country. The 2016 Environmental Performance Index, compiled by researchers from Yale University and Columbia University that evaluates how nations protect their ecosystems and human health, placed Azerbaijan 31st among 180 countries. Azerbaijan improved its performance jumping 32 ranks compared to 2014. The report that comes out every two years showed the Land of Fire has made significant progress by 18.1 percent for the last 10 years scoring 83.78 points in 2016. Moreover, the country also ranked second in climate and energy category, reducing gas emissions from 73 to 51 million of tons since 1990. Strengthening security measures and increasing its tree cover areas up to 11.8 percent, Azerbaijan achieved good results in forest resources assessment category ranking 5th.